Available in Windows Store Sensavis Win 10 app can be installed on any computer, tablet, or Surface Hub running Windows 10. Available in Apple App Store, Sensavis iOS App can be used on any Apple device running iOS 11 or newer. Control the objects with your mouse or, on a touch screen or tablet, with your finger or stylus. Learn more about each module’s content by clicking “Documentation”. Functions such as inking and a new digital whiteboard further enhance the relevance of the tool in a wide variety of classroom activities. Try the Sensavis Win 10 app for free! Try the Sensavis iOS app for free! 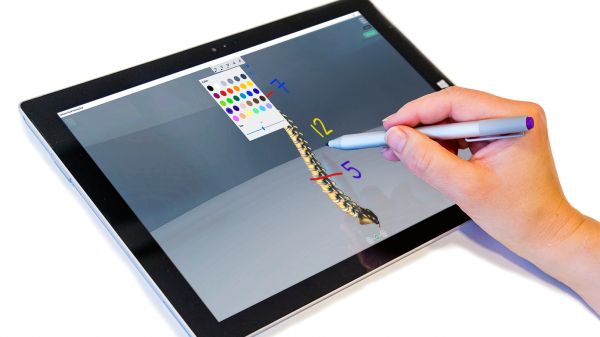 Sensavis Win 10 app features inking, allowing you to write and draw directly on the visualizations. Use the tool to further explain or highlight important information, customize your own teaching materials, or even use Sensavis as the basis for an assessment. Research shows that working with different input methods promotes learning. Read more here. The new digital whiteboard in Sensavis Win 10 app lets you draw and write on a black, white, or semitransparent screen without having to exit the app. See a tutorial on how to use the inking and whiteboard tools in Sensavis here. Get even more out of your classroom by allowing the students to explore and create in a Windows environment, by installing the app directly on student devices. If using an Apple or Chromebook environment, let students work with teacher created silent videos.